This blogpost is all about the word “mindset”. 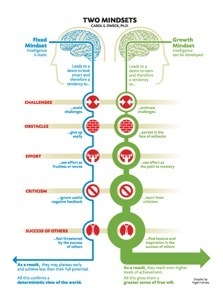 I know this has been around for a while but I first consciously came across the word Mindset at ICOT this year. It seems to have really grown on the world and in my consciousness this year and I see it everywhere now. There are many people out there selling tool kits or strategies that will make you a more effective teacher but I fundamentally believe there is no 1 correct answer for education. By having an open mindset we can make more of a difference. I was first introduced to the ideas of Design Thinking for education by Ewan McIntosh of No Tosh at ICOT at the start of the year. The idea of problematising an issue and setting students on the path to designing solutions fit well with much of the Inquiry teaching I had done over the years. I was struck however by allowing students to do the divergent thinking as well, whereas in the past I had normally given them 3 or 4 choices to choose from. The ungoogleable nature of rich tasks such as these was something I grabbed hold of and have utilised this year. The blog post Where design thinking meets inquiry shows an incredible process to use for genuinely rich inquiry. There are plenty of people out there still trying to sell design thinking tool kits but once you start reading more into it you realise that design thinking is very much a mindset to approach a task with. No matter the content of the lesson or the strategies in place, Teaching like a pirate is about presenting it in such a way that students will always become engaged and excited about your lessons. Having this mindset will not only get the students excited about your lessons but will ensure you are bouncing into the classroom each day looking forward to what may occur. These 3 mindsets outlined above all link and complement the explorers mindset I have been working to cultivate with my classes over the last 12 months. Many of you reading this will be aware of the guerrilla geography I have been involved in over the past year and may have even read some of my earlier blogposts on guerrilla geography, place hacking and exploration. If you have not come across any of this, I highly recommend that you watch the video below. It is Dan Raven-Ellison giving a talk on how we are all explorers. Dan has influenced much of my thinking over the past year and has motivated me to take some of my more rewarding lesson risks in this time. If you are asking questions, then you are exploring. Looking at the world as a new place to explore everyday can lead to some amazing discoveries and provides real learning opportunities that otherwise may be overlooked. Wow, writing this has clearly shown the influence of a few important people in opening my eyes recently. A Growth, Design, Explorer mindset which I present like a Pirate is how I’m approaching education these days. I hope you may be doing the same because although there is no one answer for education, I believe that this hybrid mindset I have outlined will definitely leave the door wide open to amazing learning opportunities. This is what my mindset for enabling learning is right now (and I’m only just starting to investigate how a maker mindset could add to it), what do you think? This entry was posted in Uncategorized and tagged Dan Raven-Ellison, Dave Burgess, design thinking, education, Ewan MacIntosh, exploration, growth mindset, guerrilla geography, ICOT, inquiry, Mindset, No Tosh, teach like a pirate, thinking, ungoogleable by stevemouldey. Bookmark the permalink. Really interesting post, Steve. Thanks very much for sharing it. I will be buying a copy of Dave Burgess’ book as soon as I can! I have read another blog post which was a kind of review of Teach Like a PIRATE. It has given me a lot of ideas for this year. I’m feeling really excited about the coming school year! I used to work with Nicole Hardy at Fraser High. She’s an awesome teacher and I’m really glad she has connected with you via Twitter. All the best in Japan! Teach Like a Pirate has definitely made my “Best Reads” of the summer. I find myself going back to it because there’s so much in it! The mind and attitude are extraordinarily powerful tools within each of us. Dave Burgess’ book confirms that many times in many ways. I’m interested in the YouTube video above & will view soon. I’m also checking into a book titled The Power of Who by Bob Beaudine, recommended by a coach. This may be another one that falls into the mindset category (but not a teacher book specifically).